North Korean leader Kim Jong-un sent a letter to South Korean President Moon Jae-in on Sunday to call for continued efforts to build peace and prosperity on the Korean Peninsula next year, Seoul's presidential office said. 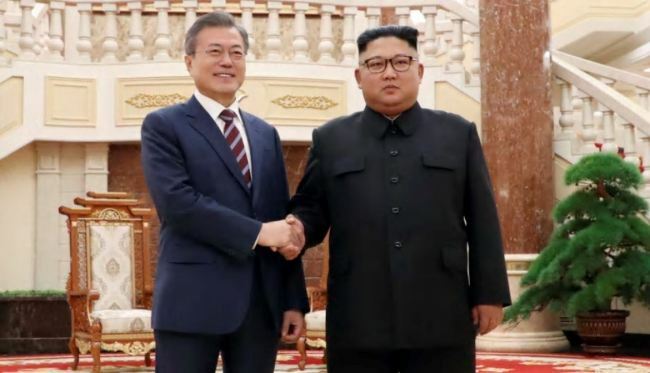 Kim also said that the leaders of the two Koreas have taken practical measures this year helping to get over long-running confrontation across their border, Cheong Wa Dae spokesman Kim Eui-kyeom told reporters. "Chairman Kim sent a personal letter to President Moon today,"
the official said. "Through the letter, he delivered a warm year-end greeting wrapping up the year 2018 and an intention to move together for the sake of peace and prosperity on the Korean Peninsula." "Chairman Kim said that the two leaders have induced practical and aggressive measures that go beyond the long-running confrontation by meeting three times in a year and emphasized that they have liberated their people from military tensions and fear of war," he added. The official said that Kim also expressed disappointment for not making his promised trip to Seoul by year's end but emphasized a strong willingness to honor the promise while closely watching relevant situations.